The chances are that at one time in your life, you’ve sat down to play a friendly game of Monopoly with friends or family. Some of the most popular memories may come from bankrupting one another or offering trades back and forth for the potential of gaining control of a portion of the board. Nowadays, the board game is tucked away in the back of one’s closet, only to be brought out during the holidays. 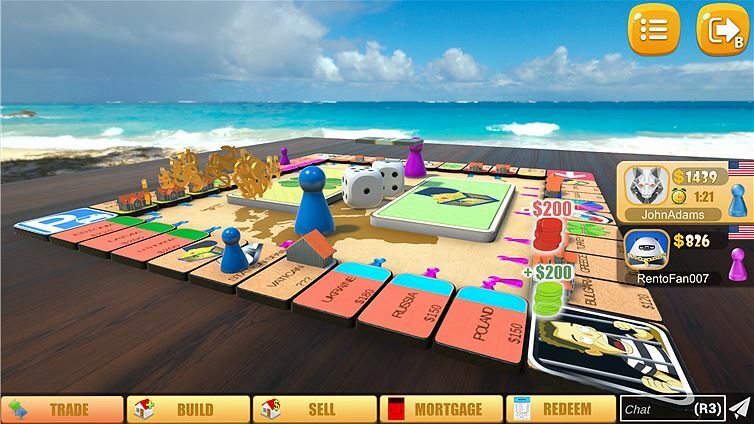 For those wanting to experience a game like Monopoly, they may find themselves looking to one of the games on a modern game console or computer platform. That’s when many players come across games like Rento Fortune: Monolit Tycoon, which from an outside perspective looks to be a more generic version of the game they’ve come to know. Can a clone of the original game still offer the same experience as the original? Rento Fortune: Monolit Tycoon is exactly what you’d expect it to be. The game board is shaped exactly the same as a Monopoly board with various colors to represent the different properties. For this board, you’ll quickly notice that the colors of the properties have been shuffled around. Some of the spacing between properties still remains relatively the same while a few others have been moved closer together. Missing from the board altogether are the utilities. Community Chest and Chance still exist in the forms of a treasure chest and a 4-leaf clover. 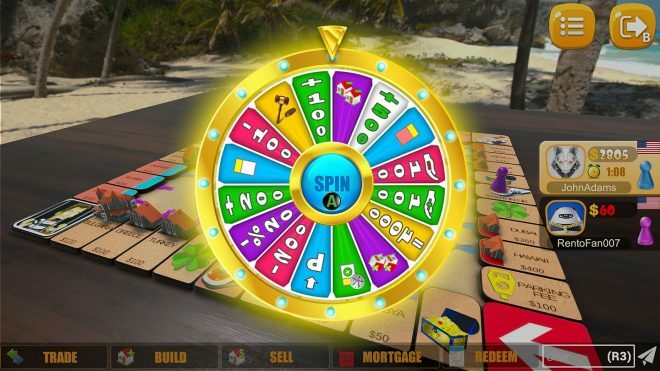 Added to the board are wheel spaces that when landed on, force you to spin for the potential of winning or losing money or properties and even potentially being forced to go to a certain space. One property, in particular, requires all players to bid amongst each other to take ownership of it. New Cards – The changes to community chest and chance don’t only come from the appearance of the icons themselves. While players will see an abundance of card ideas that are recognizable from the classic Monopoly, some new additions help the system to feel more unique. One potential card instructs that a tornado has appeared and allows a player to remove a house off of another player’s property. This can be helpful early on if a player just built up houses. If a hotel is present, this simply downgrades the hotel back down to having 4 houses on the property. It really doesn’t benefit much if the player affected has a large sum of money to simply upgrade the property again, but it can still be effective if used in the right manner. One other new addition is a card that allows you to not pay rent for a single property during one turn. The catch is that the card must be used before you roll. That means if you use the card and roll, there’s a large chance you can avoid having to pay someone a large sum of money or “waste it completely” by rolling a number large enough to avoid an enemy player’s property altogether. Train Travel – The four middle spaces on each side of the board are still the railroad properties you may have come to know and love. These properties act relatively the same as they do in Monopoly, only this time they offer an additional perk. First, you must own more than one railroad property. When you land on a railroad, you have the choice to travel to one of the other railroad properties you own. This can be really useful if you just pass go, as you can use the railroad to quickly travel all the way around the board to the 4th railroad property, for another quick $200. For balance, traveling from any of the other railroads over to the 1st does not count as you passing go, and will not allow you to collect $200. Trading with Bots – Unless you have a friend who’s also bought the game, you’ll find yourself playing against bots offline, as presently there is nobody playing online. One of the most infuriating concepts in the game comes from trying to initiate a trade with a bot. Depending on the property, bots seem to be programmed to refuse trade of certain properties. In one instance, two railroads were already owned, and a bot held the other two. Initiating trade with the bot and offering $1000 for both railroads resulted in the bot declining. Upping the ante and offering $2500 for both railroads also resulted in the bot declining. Various other offers were made, which eventually reached the point when I was offering to trade the two most expensive properties on the board and $5000 cash for their two railroads (both worth $400 max), and the bot still refused the trade. It all depends on the property you are trying to inherit. 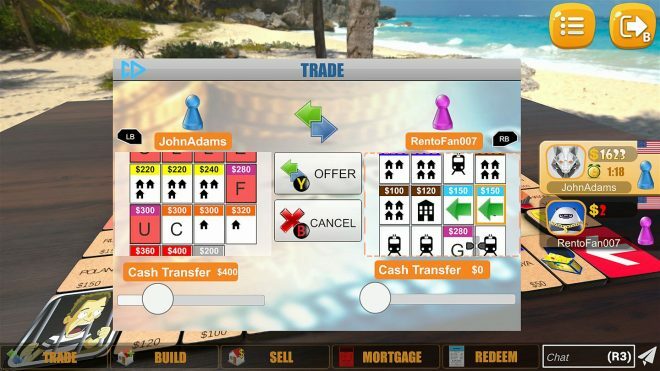 If you’re after any of the railroads, one of the two most expensive properties, or a few select other properties, the bots will simply reject all trades. User Interface – It’s clear from the interface that the game was originally meant for the mobile platform. One thing you will quickly notice is how poorly everything is laid out. Depending on the number of properties you own, trying to complete a trade with another player can be frustrating as you cannot scroll up or down between your properties. So, unless the property is in the center row, It leaves you guessing what property you have selected on the top or bottom rows. Two buttons in the top right corner are used for the menu or for leaving the game. If you aren’t careful, you will press one button intending to back out of a menu only to find you have almost incidentally quit the game. Everything seems so squished together. Trying to raise an opponent’s cash trade with the right stick doesn’t work entirely. The whole thing is a convoluted mess. Playability Issues – Lots of times on various occasions the game would seem to hang. You can still hear the music playing, and you can press different buttons to do different tasks, but the game fails to proceed. If you try to purchase a property not realizing that you do not have enough funds, the game will come to a halt. There are various other times the game would simply refuse to continue for reasons unexplained. This can be frustrating if you’re doing well in a game only for the game to stop working as intended and leave you stuck. 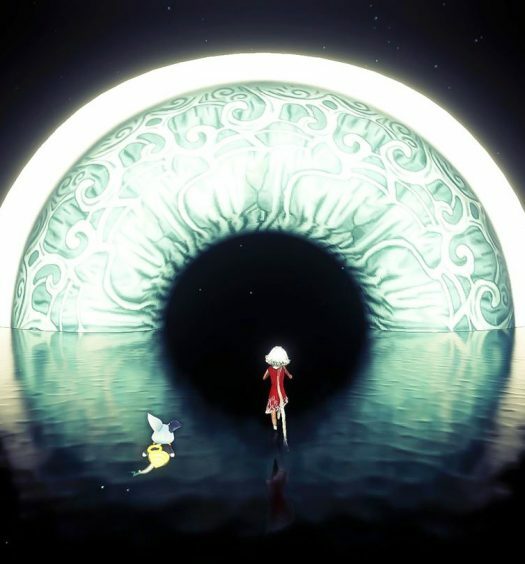 The Overall – There are a few other strange aspects of the game worth noting and some are more noticeable than others. The moment you start the tutorial, you’ll find yourself greeted by a cartoon version of Kim Jung Un who is clearly meant to represent the Monopoly Man. It’s not explained why he was the chosen icon of the game, especially since North Korea isn’t a property in the game. Speaking of properties, once you get to the board itself you’ll quickly notice the odd positioning of the different properties. Every property is either a country, a city or a monument. The least expensive include Libya and Sudan, while the most expensive include Dubai and Hawaii. Other countries include Finland, Norway, and Ukraine just to name a few. A quick search will show that Finland and Norway alone would be better choices for the most expensive countries on the board. It really leaves you to question how exactly the positions of the properties were selected. 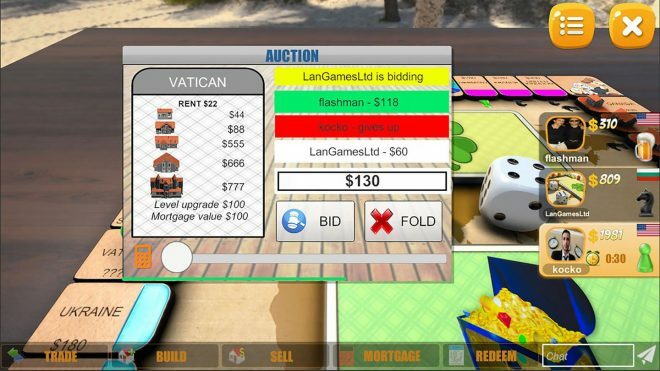 Only one property on the board does not represent a country, and that is the Vatican, which also happens to be the only property on the board that requires players to bid on for ownership. There are a few different board themes you can select from, all of which however still include the same property names. It’s questionable why you’d want to play on Halloween or winter themed boards with properties still resembling those of countries. The game does have a few different character pieces for you to select between and a few different colored dice to choose from. Computer players, however, will still always represent a different colored pawn piece and use the white dice. Local Multiplayer Woes – Rento Fortune: Monolit Tycoon does offer the ability to play the game in local multiplayer on the same console. The issue here is that the game does not support the use of separate controllers while playing locally. This means that if you’re planning to play with family or friends on the same console, you are constantly required to pass the controller between turns. This begins to get repetitive around the time that you are required to auction on a property. Every time a player goes to further advance their bid, they are required to take the controller and apply their bid. Even trades feel wonky with the use of only one controller between two players. Bot Difficulty – The overall difficulty of a “hard” bot is laughable. Bots will almost always refuse trades if they own multiple properties of one color or if you’re wanting a railroad. If you own two of one color property and a bot has the third, asking for the property and offering at least double the normal value will result in them accepting and pushing them closer to their inevitable end. At the end of one match, 75% of the board was held by the player owning the top, right and bottom portions of the board’s properties, and the other 25% was held by the bot on the left side. All this was accomplished by manipulating the bot into trading off properties they did not have multiples of. The bots can be manipulated in other ways as well to further your success. Unlimited Houses? – There comes a time in every Monopoly match where eventually the banker runs out of houses and hotels to place on properties. It’s at this point a player must wait until another player goes bankrupt or is forced to remove them before that player can purchase any. In Rento Fortune: A Monolit Tycoon, there doesn’t appear to be a limit to the amount of houses or hotels that can be placed on properties. At one point during a 6-player game against 5 hard bots, every property on the board had the equal of 4 houses applied to them. The standard game of Monopoly includes 32 houses and 12 hotels. This would indicate that the amount of houses in Rento Fortune are infinite as there are a total of 23 total properties eligible to build houses and hotels. Unlimited hotels are unknown. Quite simply, Rento Fortune: Monolit Tycoon is not worth the $9.99 asking price. Not only does the game seem as if it were meant for a mobile platform, there are no players playing online presently and playing against bots can become quite a nuisance when you find they’ll work together to gain properties, but outright refuse to trade with the player. Compared to Monopoly Plus, which is presently on the Xbox Live Store for $14.99, the $5.00 difference in asking price offers you a more genuine experience to the original board game with a 3D city to play around with. 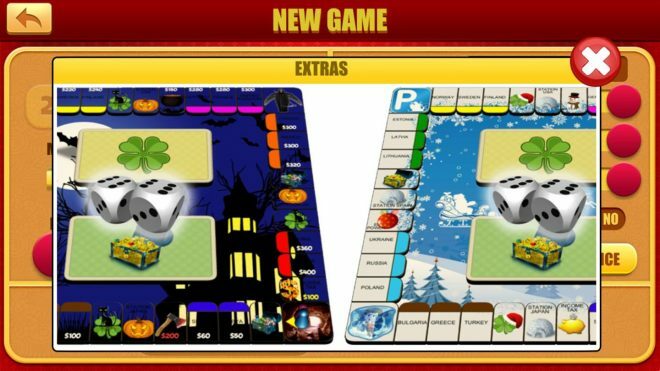 There are even optional additions for Monopoly Plus that can be purchased separately, such as different themed boards with an added animated token. The My Monopoly add-on that allows you the ability to customize the classic or 3D boards by naming your own spaces while adding 2D images to the space or 3D elements to the center of the board. This add-on truly helps to make a board creation your own. As for Rento Fortune: Monolit Tycoon, it’s best to spend your fortune elsewhere. Rento Fortune: Monolit Tycoon was developed and produced by LAN – GAMES EOOD. The game released on June 1, 2018, for $9.99. A copy was provided for review purposes.